A new bamboo- for-Africa partnership transfers know-how between China, the Netherlands, and three African countries – Ethiopia, Kenya, and Uganda. A panel of senior policy makers from Ethiopia, Uganda, China, and The Netherlands, with a bamboo business leader, held a special consultation at COP21 in Paris this week on how they will work together to use bamboo as a climate-smart tool – to drive economic growth, reduce poverty, and help protect forests and landscapes. This meeting marks the start of a new trilateral partnership to transfer know-how on bamboo development between China, The Netherlands and three African countries: Ethiopia, Kenya and Uganda. The partnership is facilitated and managed by INBAR. This is a ‘South-South-North’ business initiative. It links China’s wealth of bamboo business knowledge for poverty reduction and livelihoods development with The Netherlands’ bamboo sector expertise in production, marketing and standards. This knowledge, transferred to Ethiopia, Kenya and Uganda, will help them to assess their bamboo resources and build business models that create jobs and expand local industries. Opening the discussion, Dr. Jiang Zhaoli, Deputy Director General of the Climate Change Department in China’s National Development and Reform Commission (NDRC) commented on the climate-smart benefits of bamboo: “Forest resources, including bamboo and rattan, have a unique place and role in China’s efforts to address climate change – both domestically and internationally,” he said. Commenting on China’s experience Dr. Jiang noted the development potential of bamboo. He pointed to the potential role bamboo could play in alleviating poverty and improving the livelihoods of rural communities. International cooperation, he believed, was key to effective knowledge transfer and the development of Africa’s fledgling bamboo sectors. The African partner countries recognise the climate-smart benefits of bamboo and are investing in production – seeing that the plant can help drive their green economies, by providing a new source of jobs and protect forest resources. Bamboo will be a key element into Uganda’s ‘Vision 2040,’ an ambitious strategy to modernise the country’s economy, alleviate poverty, and improve income and livelihoods. In an effort to harness this potential, Uganda is benefiting from the expertise of China, the world’s leading producer of bamboo. Through this ongoing South-South partnership, the country is strengthening its fledgling bamboo sector and implementing tested conservation methods to protect its forest resources. Bamboo development is also progressing in Ethiopia, where a strategy and vision for the plant’s development supports the national Climate Resilient Green Economy Strategy. A briefing on these plans, given by Dr. Yigremachew Seyoum Lemma, Director for Forest Policy and Strategy at the Ministry of Environment, identified areas where bamboo can add value: local economic growth, greenhouse gas reduction, restoring degraded lands, and combating desertification. The country is progressing in these areas today. Policies are in place to encourage sustainable management of bamboo, a range of bamboo development projects are running with international agencies, and non-governmental organizations –including a longstanding partnership with INBAR – and the government are both supporting bamboo conservation management and utilization initiatives. Ethiopia is addressing these issues through its Bamboo Sectoral Strategy Framework and the current Bamboo Strategy 2013-2015. This new South-South-North partnership will support Ethiopia’s next steps – as more bamboo business know-how is transferred to Ethiopia from Chinese and Netherlands experts – on enterprise development, value-added production and links to international standards. Both Uganda and Ethiopia had a cautionary word – their bamboo resources were being lost at a rapid rate. 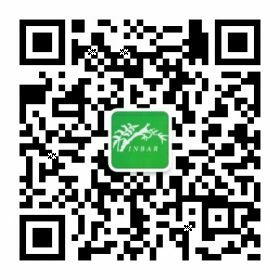 Here, the Global Assessment for Bamboo and Rattan (GABAR) can help solve the bamboo development problems that they face, advised Hans Friederich, INBAR’s Director General. 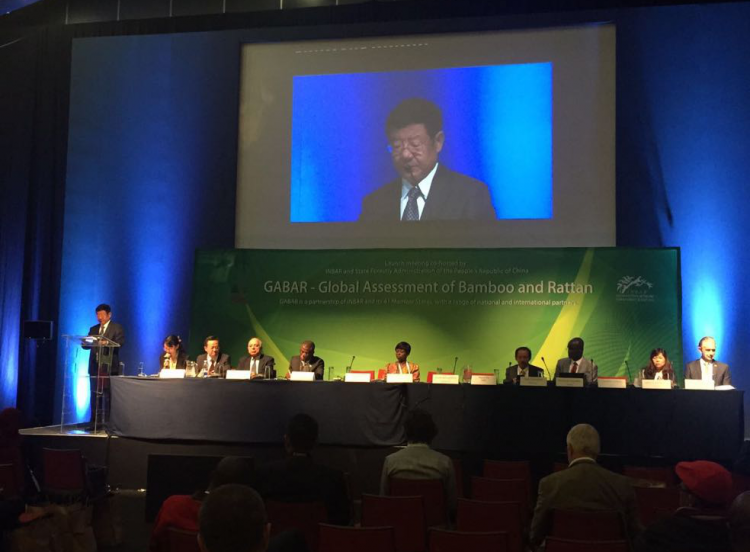 GABAR is facilitated by INBAR with its Member States and aims to improve access to knowledge of all kinds that countries can use to protect and expand their national bamboo resources. “The assessment of existing bamboo and rattan resources is a first step for countries to plan the growth of their bamboo sectors, as the look at the value chains that they can develop to create jobs and open new markets,” he says. At the meeting, both Uganda and Ethiopia said that a mechanism like GABAR can bring new knowledge that will help protect their bamboo resources. Neither country has the data it needs to effectively plan and assess development – although Uganda has undertaken initial assessment of its bamboo resources and an analysis of relevant policies. Based on a fundamental assessment of the resource base, both countries have said they want support to build capacity, increase access to markets and build value chains. They see this trilateral partnership as a way to achieve this. Commenting on the business opportunities that bamboo brings these and other African countries, Dr. Friederich described Africa’s current small formal bamboo private sector that is emerging but needs to be encouraged. “The continent has a lot of potential to harness bamboo to create jobs and grow vibrant national bamboo economies. Countries now need significant technical, financial, and policy support to grow their markets. They also need to improve product quality, which will open the door to expand domestic business and tap export markets for high-value, high-profit bamboo products.” The ‘triangular cooperation’ approach of this partnership is a good example of how China and The Netherlands can combine their expertise to bring real, practical development benefits to African countries, he said. Learning from China’s expertiseAs the world’s leader in bamboo processing and value chain development, China has supported African bamboo sector development for many years, and has much expertise to share with the African partner countries. China’s innovations and policy support have seen its domestic bamboo sector grow from a subsistence activity in the 1980s, to a vast industry, currently worth some USD30 billion a year, employing 7.75 million people, and has restored over 3 million hectares of degraded land. Internationally, China leads bamboo export markets, accounting for over 60 per cent of trade. 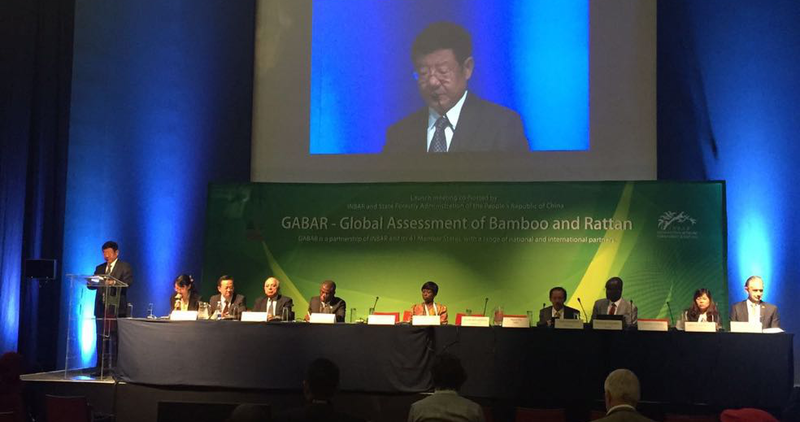 Dr. Wang Chungfung (SFA, China): bamboo is irreplaceable for the fight against climate change. Under Dutch leadership, Europe plays a key role in driving recent bamboo sector development, particularly for the high-value bamboo products that are in increasing demand by consumers looking for a ‘green alternative’ as they spend their money.The Netherlands puts a special emphasis on using trade as a development catalyst, advocating that strong economic ties will create jobs and reduce poverty. Speaking at the session, Jacob Waslander, Manager of Inclusive Green Growth and Head of the Climate Team at The Netherlands Ministry of Foreign Affairs, voiced his country’s enthusiasm for the south-south-north approach of this new programme. “What better place to announce our upcoming cooperation in with China, Ethiopia and Uganda and Kenya than in the China Pavilion at COP21. We look forward to exploring trilateral cooperation to harness China’s vast knowledge of this remarkable plant to achieve three critical impacts: climate change mitigation and adaptation; reducing poverty; and increasing trade,” he said. Mr. Jacob Waslander (Ministry of Foreign Affairs, Netherlands) stressed bamboo’s importance as a vast carbon sink, and a tool to expand new forest resources that will reduce deforestation in other locations, and the plant’s ability to rapidly restore severely degraded lands. Bamboo’s unique environmental properties will help millions of people living in rural areas who are affected by climate change, to live better lives and escape poverty. Added to this, he says, is the plant’s potential to open new sectors of economic activity, both for local communities and national markets. “In this partnership, the Netherlands, China, and African populations will benefit from the creation of strong bamboo value chains, developed in line with international standards. Concluding, Mr. Waslander commented that the partnership is a good demonstration of the The Netherlands’ new development approach, encouraged by Minister or Foreign Trade and Development Liliane Polemen, that integrates trade and investment considerations into development projects. This is also a testimony to China’s commitment to address climate change mitigation and adaptation as evidenced by President Xi’s recent announcement in New York of a reserve of RMB20 billion (USD2.9 billion) for the China South-South Cooperation fund, and recent figures that place China at the top of the list of investors in renewable energy. Arjan van der Vegte, Research and Development Manager at Dutch bamboo producer MOSO International, stressed that Dutch expertise in marketing, standards and technical quality will help rural communities in Africa tap into lucrative export markets where the demand for sustainable products continues to grow. In addition to MOSO International, the world’s largest importer and distributor of bamboo products, the Netherlands also has a number of technical and civil society institutions – Delft University of Technology (Life cycle analysis and product design); Eindhoven University of Technology (bamboo construction and ISO standards); Wageningen University (bamboo fibre); The Netherlands Standardization Institute (standards); and Netherlands Development Organisation, SNV (bamboo value chains in Africa). With Dutch leadership, Europe has become the largest bamboo product importer, with some 38% of the total market, more than double that of the USA (18%), the second largest importer. Panelists and discussants at the consultation included: Mr. Jiang Xiali, Deputy Director General of the National Development and Reform Commission (NDRC), Dr. Andrew Bennett, Chair of INBAR’s Board of Trustees, H. E Michel Rentenaar, Climate Envoy for The Netherlands, Ms. Ermida Fida, Coordinator of the United Nations Environment Programme (UNEP) Climate Change Sub-programme, and Dr. Hans Friederich, INBAR Director General. • Business development: Survey and assessment of bamboo resources and value chains in East Africa, including business plan development, technology transfer and capacity building on bamboo resource management, processing, product design and marketing. • Investment promotion: Investor and industry study tours and workshops; trade dialogues on policy, product custom codes and standards; capacity building for African National Standards Bureaus and private sector companies on bamboo standardization. • Landscape restoration: Planting of bamboo on degraded lands; life cycle analysis and carbon accounting methodology development for industrial bamboo products; and climate financing developed for bamboo reforestation and afforestation projects in Africa and China, as well as durable bamboo products. • The initiative was announced at ‘Bamboo for Climate Change Action,’ – an event at The China Pavilion, COP 21, on December 7. • Images from the event can be viewed here. • Read the presentation ‘The role Dutch Innovation can play in supporting bamboo producer nations’ here. • Read the presentation ‘Assessing the Climate Mitigation Potential of managing bamboo resources in China and beyond’ here. • Read the presentation ‘Uganda’s vision for bamboo sectors and the role of trilateral cooperation’ here.